Thank you to Voodoo Misfits motorcycle club Table Rock Chapter for hosting their annual teddy bear drive for the center. The club gathered and delivered over 50 plush animals and raised funds for the CSC over several weekends. Every child that walks through our doors gets to pick out a stuffed animal to take with them. We love seeing all the unique animals to pick from! Thank you to Springdale High School's Family, Career and Community Leaders of America members for creating Halloween buckets for our kids filled with candy and treats. They also donated juice boxes and snacks for the Center. Thank you Junior League of Northwest Arkansas for providing back packs for our kids and teen girls. The packs are filled with books, stuffed animals, toiletries, coloring books, socks, and other necessary items. Junior League also donated new clothing and coats. We love that the packs are already put together and tagged for appropriate gender and age. They are easy to grab during a crisis. Ozarks Cares, Ozarks Electric Cooperative's employee initiative, distributed $37,595 to three local non-profit organizations and the Children's Safety Center was one of them! All funding is collected through an employee pledge campaign and is matched by the cooperative. Employees of Ozarks Electric are able to nominate non-profit organizations to receive funding. The organizations are then voted on by the employees. We are so thankful to the employees of Ozarks Electric for choosing to donate over $16,000 the CSC! 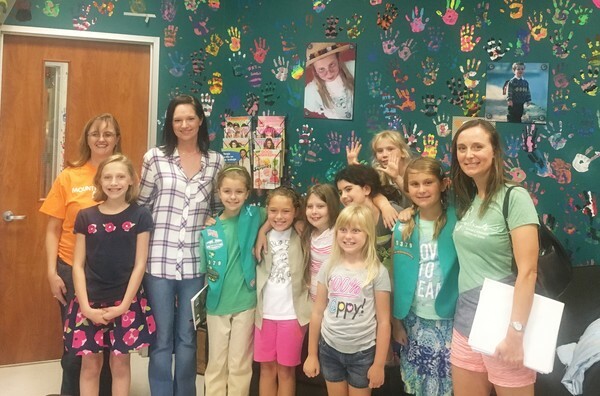 Thank you to Girl Scout Troop #5379 for stopping by the Center for a tour, learning how to protect themselves from child predators, and for donating part of their cookie sales to our programs. Meet The Youngins with DeSigns by Youngins in Fayetteville. The Youngins are passionate about helping other children, especially children in our local community. Enter the Children's Safety Center! The Youngins met some of the people who work here, toured the facility, learned about the services offered and wanted to help. The Youngins had $50 in their giving fund. They wanted to give $50 to the CSC. Okay. We can do that, said Mama Youngin, Or…we could use that $50 to make a product, and earn more money to donate to the center. Yes!!! That sounds great. They spent their $50 on materials to make canvas bags. They discussed how, if nothing else, they would donate all the bags to the CSC so they could use them or give them away. The Youngins posted some photos on their Facebook page…and they completely came through for us. They donated $150 to the Children's Safety Center and have already created their second batch of "Restoring Dreams" bags, and are excited to donate more money to the center. 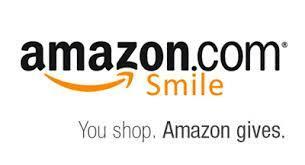 Use AmazonSmile while shopping this holiday season and Amazon will donate 0.5% of the price of your eligible AmazonSmile purchases to the Children's Safety Center. It's that simple! AmazonSmile is the same Amazon you know. Same products, same prices, same service. It just takes a minute to sign up.